A Central Link light rail train at Beacon Hill station. Photo by Flickr user ishell. If friends ever try that to claim you can’t have a successful transit system without rails in the ground, just nod politely and tell them to visit Seattle. The Emerald City didn’t have an inch of modern rail transit until a starter streetcar line opened in 2007 and a light rail line debuted in 2009. As for that short monorail of theirs, it’s mainly a tourist attraction with pretty meager ridership. Seattle’s transit bread and butter has been its robust network of buses. Thanks to those buses, the city can tout the fact that nearly 18 percent of all commuting trips are by transit. In that category Seattle ranks 14th nationally, ahead of several rail-served cities such as, for example, Oakland. That East Bay city has eight BART stations connecting it to San Francisco. That’s not to knock rail transit — far from it. The increased capacity rail provides can make it a sound investment in very busy corridors. And that’s where Seattle region is targeting its transit investments. The existing Link Light Rail system with future extension. That November, the “$17.9 billion measure to expand light rail, commuter train and bus service won easily,” according to the Seattle Times. With that victory came the burden of expectations. Seattle’s first light rail line, dubbed the Central Link, opened on time and within its budget the following year, thanks to an earlier ballot measure called “Sound Move.” As a result, it’s possible to travel between downtown Seattle and SeaTac Airport in just 36 minutes, averaging 26 miles per hour. For reference, that’s a hair slower than the Pasadena leg of the Gold Line. Future extensions of the Link system include a 3.2-mile extension to the University of Washington expected to open in 2016 and to generate 70,000 additional boardings by 2030. Suffice it to say that moving that many people from UW to downtown in six minutes is the strong suit of rail. Two more lines — North Link and East Link — are funded partially by Proposition 1, but are not expected to open for at least another decade. 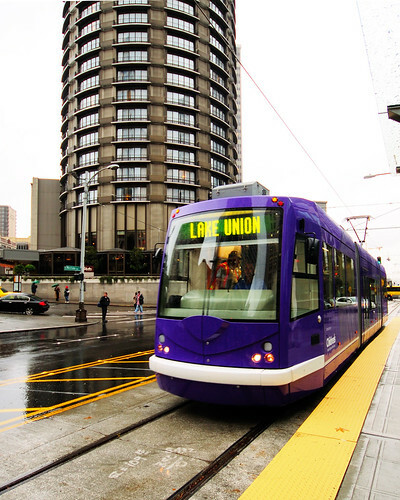 The South Lake Union streetcar line is the first in a series of planned downtown streetcars. Photo by flickr user WintrHawk. Sound Transit, like many transit agencies around the country, are facing a tough financial picture: the global recession has brought decreased sales tax revenues. If America Fast Forward were made law, and Seattle had access to federal loands and other financing, unemployed construction workers could be put to work right away, taking advantage of cheaper construction costs and providing better transit service sooner. We’re not the only ones with AFF on the brain. At least one Seattle-area writer has taken a look at America Fast Forward as a mechanism to speed up transit projects and put Seattleites back to work. Led by Mayor Antonio Villaraigosa, the city leadership has put together a plan to build 30 years of transit projects in the next 10 years. It will use a new half-cent sales tax, passed in 2008, as collateral to sell long term bonds and secure a low-interest federal loan. It will then take these billions of available funds and accomplish 12 transit projects in 10 years. And it goes without saying that taxpayers like to see their tax-supported projects come to fruition. Seattle’s Proposition 1 might be “an act of great generosity to our grandchildren,” as one local elected put it. With AFF, everyone could reap the benefits. Sound Transit Communications Specialist Bruce Gray said in an interview that the agency is keeping an eye on America Fast Forward as it makes its trek from the drawing board to, hopefully, federal law. But for now, Sound Transit is just thankful for all the federal help it’s getting through the federal New Starts grant program. If AFF comes along, they’ll cross that bridge when they get there. The U.S. House version of the next federal transportation bill includes elements of America Fast Forward but has also been criticized for cutting existing funding for building transit. If the time comes, Seattle will be in good shape to take advantage of America Fast Forward. And, as we’ve shown in the past, AFF holds promise for cities in all corners of the U.S. See our previous features on Denver, Salt Lake City, Charlotte, Minneapolis and Houston. I have ridden this light rail several times on visit to Seattle and it works beautifully. Here’s hoping it expands northward and eastward sooner than planned. I am from Seattle, and if you’ve been paying attention to local Seattle papers you would have noticed that the first leg of the Light Rail has been disastrous. Daily boardings are far lower than initially projected mainly for three reasons. First, it is really only useful downtown because the majority of the line avoids major transit destinations. And second, just as in LA, parking at the stations has been highly contentious as they deliberately built less parking to force people to find alternate ways of getting there. Commuters can’t find parking and therefore skip the light rail altogether. Finally, even though most of the line goes through and stops in dilapidated neighborhoods, the promise was that transit-oriented development would blossom around the line. This hasn’t occurred because the line was finished right as the economy collapsed and developers consequently won’t build. There is hope that the next part of the line will be useful, but generally the consensus has been that all practical recommendations and concerns were ignored in the design and planning the first time around. Light rail in Seattle is not disastrous. Please tell me what “transit destinations” you would like to reach between Sodo and the airport. The line was run through the Rainier Valley where people who actually need it have access to it. Ridership is robust and is going to explode when U-Link opens. As for parking, there is plenty at the Tukwila station. If you live elsewhere you’re either well served with a bus to downtown or shouldn’t expect transit access in your low density domicile. I have ridden this LRT line and I will say that it it generally operates smoothly but is slow through the downtown tunnel and on curves. I must commend the line however for having full signal preemption in the street running section (again something LA cant seem to get right…). The line seemed to have a moderate amount of patrons although nowhere near at capacity. It can certainly serve as a lifeline during bad weather when I-5 is backed up. I rode it during good weather though from downtown to the airport and traffic on I-5 was not bad so it probably took longer than driving but most importantly this line is good for Seattle because its another alternative in a generally transit starved region. But yeah it needs TOD. I cant say i like the mentality of “don’t expect transit access in low density areas.” as Brian said. That is counter productive and only encourages the use of the car to go the full way as opposed to a local park and ride. The U link will be very important and useful and so will the east link. Hope Seattle can get it done soon. Seattle needs to continue to go down the path Portland did with their transit. Brian, I’d like to point your attention to a few articles from the Seattle Times. This one, titled “Would-be light-rail riders bemoan lack of parking,” explains how light rail planners deliberately made life difficult for park and riders. The line was designed “with a long term eye” for TOD, except that hasn’t happened in the three years since the line opened. Consequently, and I’ve experienced this many times at the Tukwila station you mentioned, it is impossible to find parking anywhere. As far as destinations between SoDo and the Airport, the two most obvious would have been Boeing (a gigantic employer in the region) and Southcenter Mall (a gigantic and wildly popular shopping mall). In sum, ridership is not robust, there is no parking, and they avoided major transit destinations. Other than that, a gigantic success! Jeremy, I’ll assume you’re making these arguments in good faith and respond accordingly. You’re almost definitely correct that they’ve limited parking at transit stations, and that’s exactly what they should be doing. Transit-served areas are extremely valuable (just look at how it affects property values, and how pro-transit the developers near these lines are), and to use that space on parking is a huge waste of a very large investment. I will grant you that the bus system can most likely be improved to get people to the rail more quickly and efficiently, but that’s a different discussion entirely than saying we should fill up transit-accessible areas with a bunch of empty cement. Your argument that the transit-oriented development hasn’t come to fruition is what really galls me here. As this article notes, the first section of the rail opened in 2009 right at the height of a recession. Even in the best of times this kind of development takes time, and it also takes time for people to respond to the incentives of having newly-built quality transit. This actually ties in to your complaint about parking – if we fill the space with parking lots instead of homes and retail locations you can expect the interest in moving to these areas to decrease substantially. Development takes time and people can’t instantaneously live near these new locations either. I’m sure you were someone who has an axe to grind because you were against light rail in the first place, but the things you’re complaining about are extremely premature and, as you say yourself, largely explained by the recession. Many other cities have densely-populated urban stops without parking along with far flung stops with “park and ride” or “kiss and ride” lots. D.C. most prominently comes to mind here. I am not advocating massive amounts of parking for Pioneer Square. Tukwila, however (and here it’s obvious that you are not from the Seattle area), is a suburban stop one station from the end of the line. It’s in – and surrounded by – suburban neighborhoods and it’s primarily where people would like to be able to drive to in order to ride into Downtown Seattle. For all the hyperbole about TOD, in the meantime people actually need to get to the train. A lot of people who otherwise would like to take the Link can’t because they have deliberately made it difficult to get there. It’s laughable that you would think that I’m an opponent of light rail or have some axe to grind. You really think these NIMBYs are reading the Source? I lived in D.C. car free and LOVED it, but recognized that in stations like Shady Grove College Park, and Greenbelt park and rides with ample parking are absolutely essential. It’s clearly not empty cement in the case of Tukwila because it’s packed all hours of the day. As far as the recession goes, ridership numbers are still well below projections made after the recession began. Look, my opinion on Seattle’s first light rail segment is actually reflective of the majority of residents of Seattle. People want rail in Seattle (as do I), but they want rail that is designed and implemented intelligently. Anyone who thinks the Link has been disastrous never wanted it to succeed to start with. That ONE rail line carries 8% of all public transit in the King County area. Our predictions were that it would carry 12%. So It’s carrying less but I’d still say that one line carrying 8% by itself is far from disastrous. TOD is actually starting to happen at the Othello station as anyone who reads the local newspapers would know. As far as the original article saying that the monorail has pretty meager ridership I think they should look at the numbers again. So we’re not talking millions here but it’s ridership is 3x the South Lake Union streetcar and the Tacoma Link COMBINED. It carries about half as many passengers as the entire Snohomish County bus system and that’s counting ALL of their buses. It’s biggest problem is it only has two stops and isn’t part of the ORCA system so you can’t transfer. This pretty much counts it out as a local transport link. If I could transfer I’d take it all the time. I think you’ve just got a fundamental difference of opinion on the goals of investing in light rail. I think it is both a means of transportation and also a seed for new, dense development at each station. Tukwila is certainly not as densely-populated as areas further north up the line, and if you fill the immediate area with parking lots it never will be. It’ll always be a suburban area and only convenient as a means of transportation for those that can even fit into the parking lots. You’re passing up a huge amount of potential growth and economic activity (activity that increases the supply of housing and also helps offset some of the cost of the rail investment) and instead subsidizing the people who a) have the money to own a car and pay to park there and b) have chosen to live in a suburban area that doesn’t warrant such a huge expenditure just for their transportation convenience. Sorry, the above comment is directed toward Jeremy, just to make that clear.